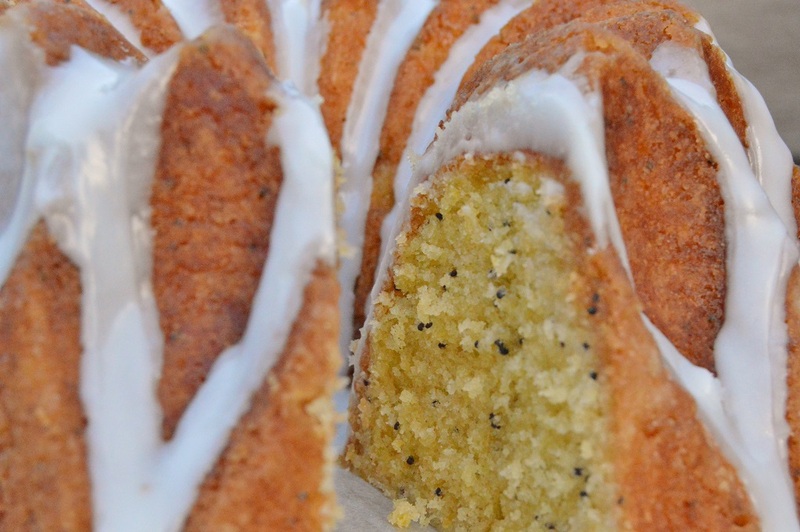 This very easy cake has bags of flavour. 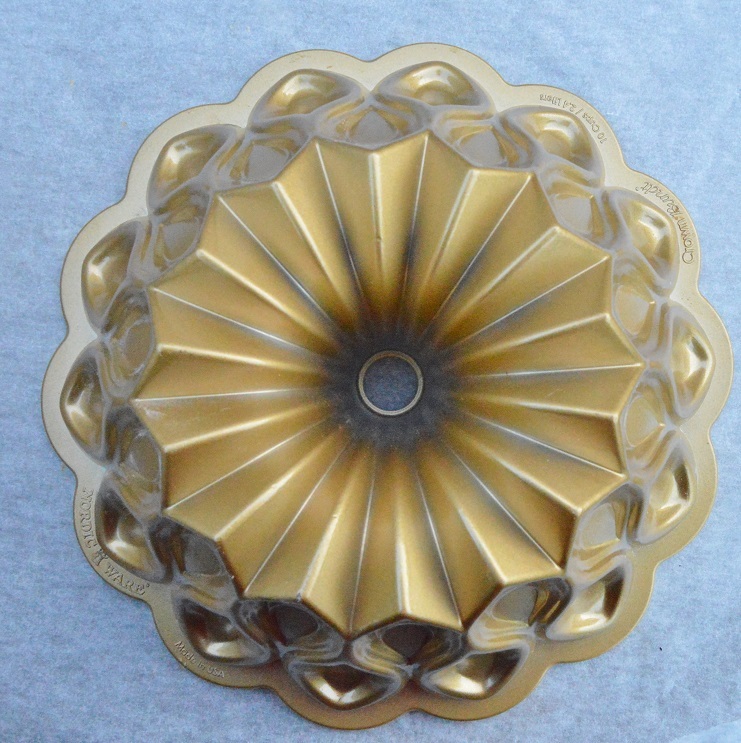 In my view, a bundt cake, as indeed any cake, should not be at all apathetic – no matter how ornate it looks: it absolutely needs to have the “wow” factor in the flavour, too. 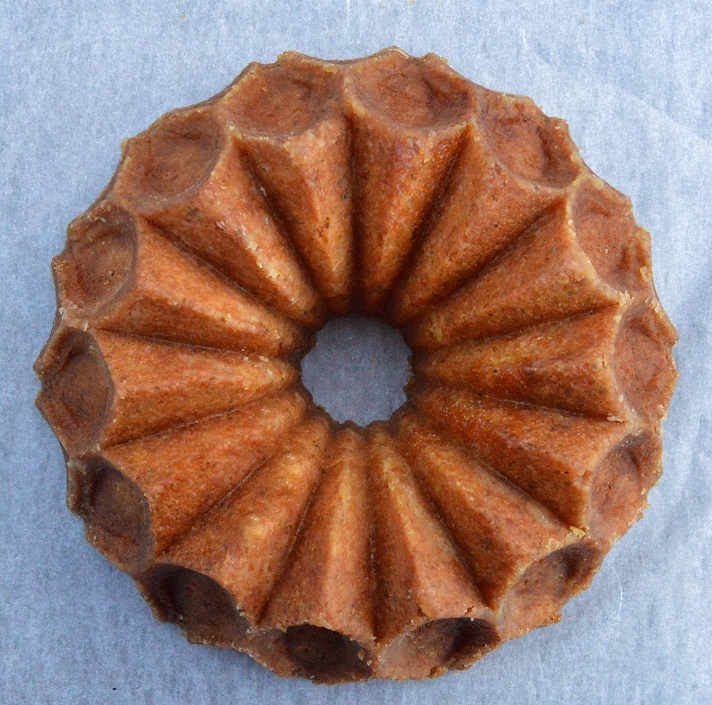 Using my first “proper” bundt tin, this is my bundt version of a drizzle cake, one of my favourite ever cakes. I have gone for a lime drizzle, with just a hint of star anise. 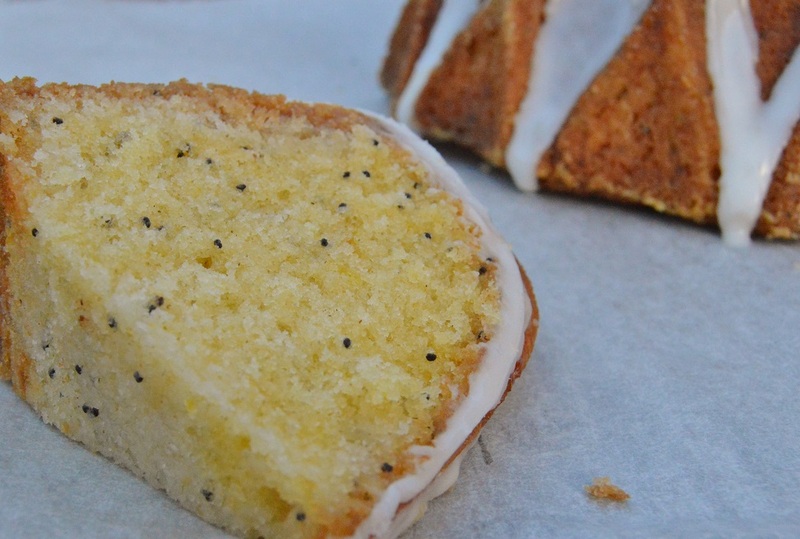 The sponge is flavoured with lime zest and a few poppy seeds, as poppy seeds go so well with citrus fruit: not too many poppy seeds, though, as you don’t want to be crunching endlessly on them, but enough to give small bursts of the flavour they bring. The flour acts as a very thin protective layer between the cake mixture and the tin, so as it bakes, it coats the cake, allowing the cake to come away from the tin with ease. The other trick is to leave the baked cake to settle in the tin for about 20 minutes before turning it out: this will allow it to firm up slightly, making it less fragile when turning out. The cake is very moist once the drizzle has been added, so additional icing is not essential, but I like the striking contrast you get with the white icing and the deep golden colour of the sponge. 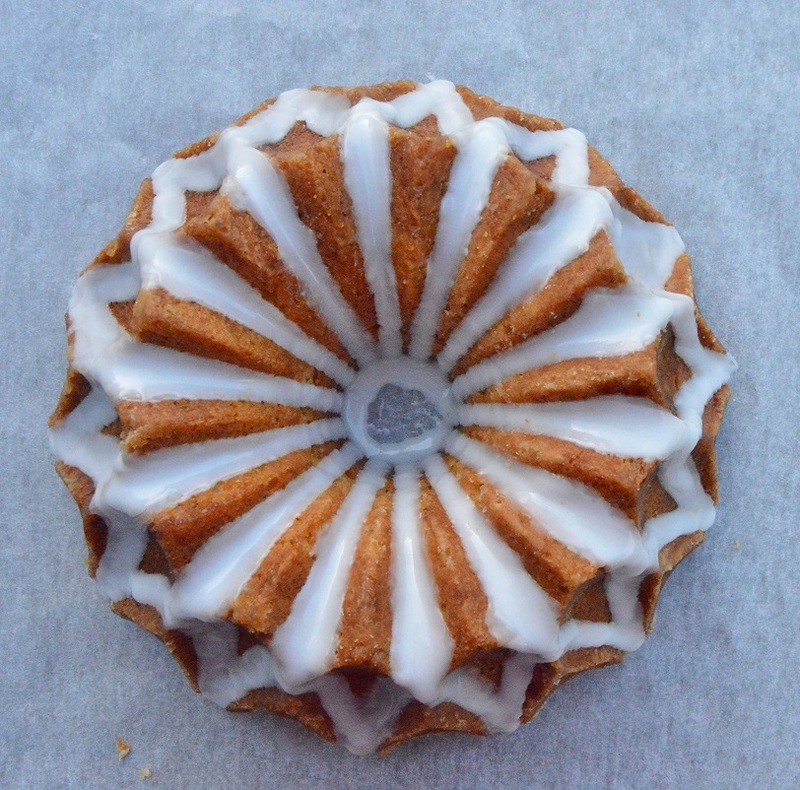 I use lime juice in the icing, as it is great way to get even more lime flavour. 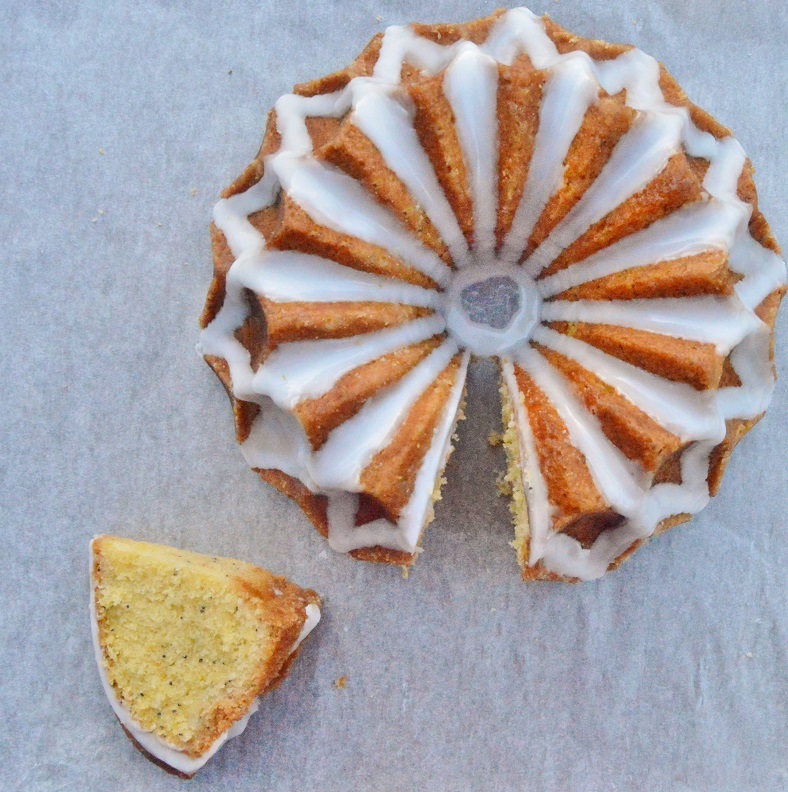 I have made drizzle cakes using a splash of gin as the liquid in the icing. I use fondant icing sugar rather than standard icing sugar, as it sets more thickly, but either icing sugar works well. 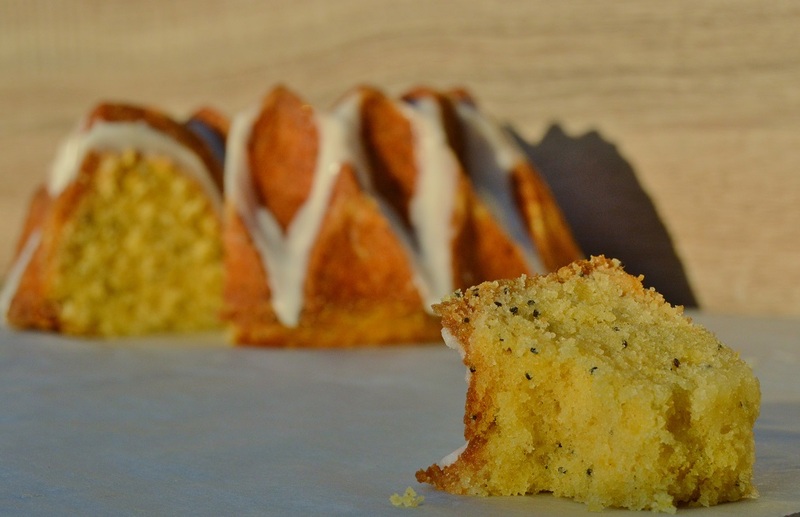 For a lemon drizzle, use the 4 large lemons in place of the limes, using the juice of almost one lemon for the icing and the rest of the juice in the drizzle mixture. I have gone for the creamed method for the sponge here, which gives a lighter and more melt-in-the-mouth cake, but you can mix all the cake ingredients together as an all-in-one cake, but sift in 2 teaspoons of baking powder with the flour. (1) Prepare the tin: pour the butter into the tin and use a pastry brush to ensure the butter has gone into all the crevices. Add the flour and rotate the tin so that a light dusting of flour coats the inside of the tin, including the crevices. (2) Whisk the butter, sugar, salt and lime zest for about 5 minutes until very pale and almost mousse-like. Make sure you scrape down the sides from time to time. (3) Add the eggs, a little at a time, to the mixture, whisking all the time. If it starts to curdle, don’t worry: simply add a spoonful of flour and keep whisking. (4) Sift the flour and fold gently into the mixture, along with the poppy seeds, until all the flour has been incorporated. Spoon into the prepared bundt tin, going to about three-quarters full. (5) Bake in an oven preheated to 160C (fan) for 50-60 minutes until well risen and golden-brown: a cocktail stick inserted into the deepest part should come out clean. Don’t worry about any cracks or doming as these will be on the bottom of the cake once turned out*. (6) While the cake is baking, make the drizzle: heat the star anise, sugar and lime juice in a small pan and bring to the boil. Simmer for a few minutes then remove from the heat, keeping the star anise in there to infuse. (7) When the cake comes out of the oven, make holes all over it with a cocktail stick or a sharp knife, going fairly deep into the cake. Pour the drizzle all over, letting it seep in. Leave for about 20 minutes before turning out onto a wire rack and removing the tin, which should lift off easily. Leave to cool fully. (8) Make the icing by mixing the icing sugar with the lime. Add enough water to give an icing that is fairly thick but it slowly pours: you don’t want an icing that is too runny as it will simply pour off the cake without much sticking to it. Spoon the icing over the cake however you want. 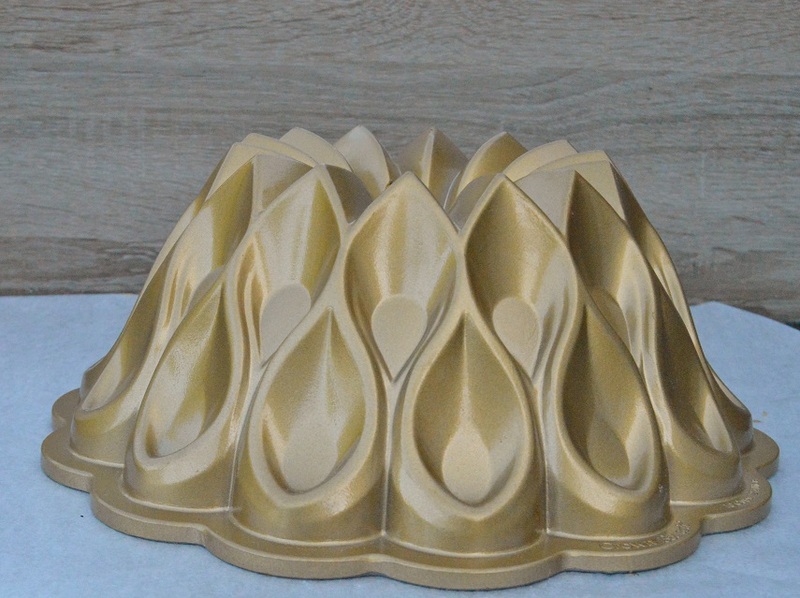 * if the cake domed during the baking, once it has been turned out and is fully cool, invert it again carefully and slice off the dome, so that when it is turned back over, it is perfectly flat. The sliced off bits will taste great! That is simply gorgeous! 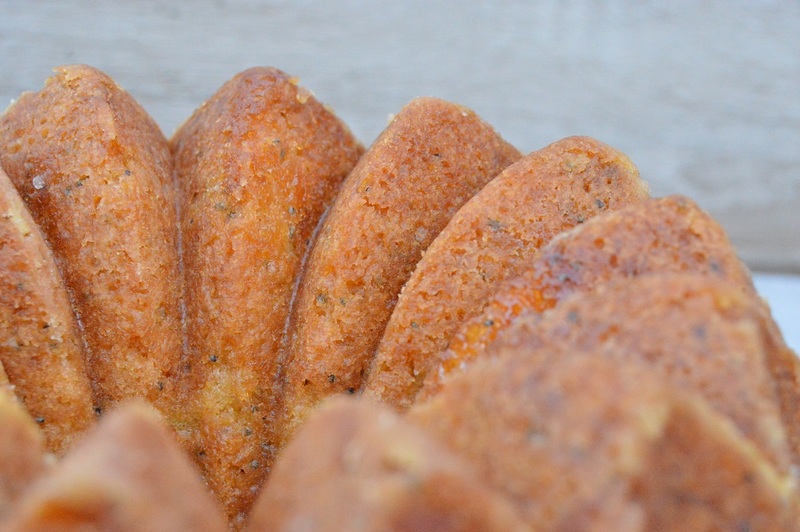 I love the effect of the icing in this type of a Bundt cake… makes me want to splurge and buy one just like yours! thank you. oh you must try it: it can actually take more star anise, but I know that can be an acquired taste! Next Next post: Pork, apple & apricot pie: a left-overs feast!